Home Cat News & Articles Cat Behaviour These videos will keep your indoor cats entertained! Own an indoor cat? Give them a taste of the outdoors, indoors! Quick read: Why do cats purr? Own an indoor cat and need an extra source of stimulation? Videos for indoor cats are guaranteed to help! There are lots of benefits to keeping cats indoors; risks such as illness, disease and theft are greatly reduced for example. But there are also negatives. Indoor cats have a tendency to be much less active, and all that lounging around can lead to boredom and issues such as weight gain if your indoor cats aren’t kept mentally stimulated. Toys will help keep your indoor cat entertained (and there are whole product categories dedicated to this), as will old favourites like hide and seek and even the trusty cardboard box! But as much as we’d love to, constantly playing with our indoor cats isn’t always an option (someone’s got to run Best For Cats — Ed), and luckily there are some excellent resources available online. Enter everyone’s favourite video website YouTube, and the trove of videos shot and edited just for cats! Best For Cats’ resident TV critic Big Alf eyes up his nemesis! A great way to keep your indoor cats entertained! We’ve added one of our (well, Big Alf and Ali’s) favourite videos at the top of the page. It was the sound that first got their attention; the opening scene of birds chirping had them racing through to the living room faster than you can say the word ‘Dreamies‘. And as soon as they saw the birds, they were hooked. We sat for a good 10 minutes, one cat sat with his face right up to the television, with the other sat on the floor, both glued to the action. It took an actual real-life bird performing a flyby passed the windows to tear them away. 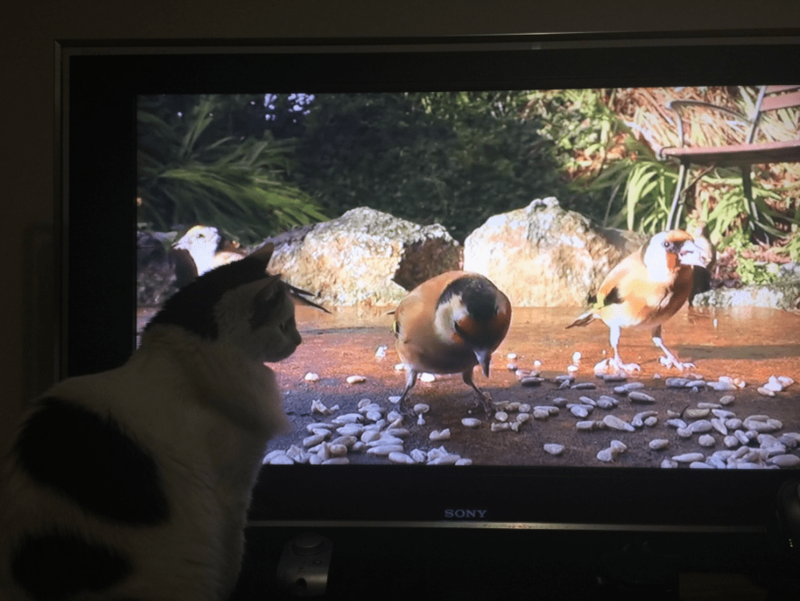 So if you’re struggling for time or need to concentrate on some work or revision, but your indoor cat just won’t leave you alone, load up one of these videos for cats on a television or iPad and keep them entertained and amused. Just don’t forget to give them some fuss once you’re done. Enjoyed reading about how YouTube can help keep your cat entertained? Sign up to our newsletter! Previous articleIs this the world’s most photogenic cat?